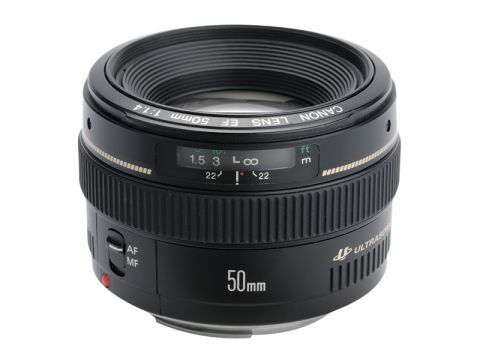 The Canon EF 50mm f/1.4 is a pretty unassuming-looking lens. It's not big, it's not flashy and it's not particularly expensive for a fast prime lens. Indeed, the light weight and the plastic finish do give it a faintly cheap feel. And while this lens does have a proper distance scale (it's only cheap zooms that don't), it's in an unusual position right at the front of the lens barrel. The metric markings are easy enough to make out, but imperial distances are labelled in dark green and they're not so easy to see. There's only one set of depth of field markings too, for f/22, which isn't an aperture you're likely to use every day. But it's a good lens to use. Canon's USM autofocus system offers fast, near-silent focusing, and this lens offers full-time manual override, too. Just turn the focus ring on the front of the lens to fine-tune the focus as required.